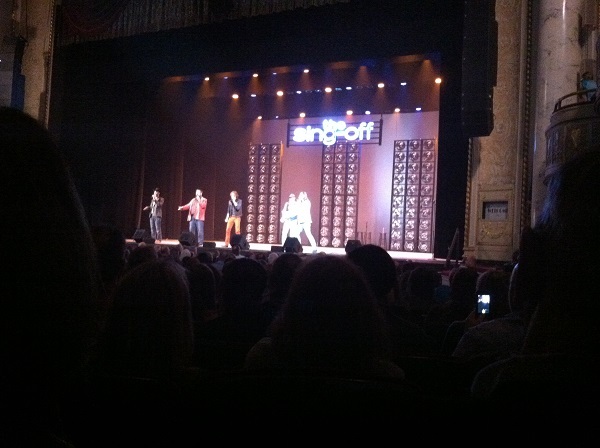 The Sing Off tour came to Proctor’s in Schenectady this week! What is the Sing Off you ask? (as many people have asked me). 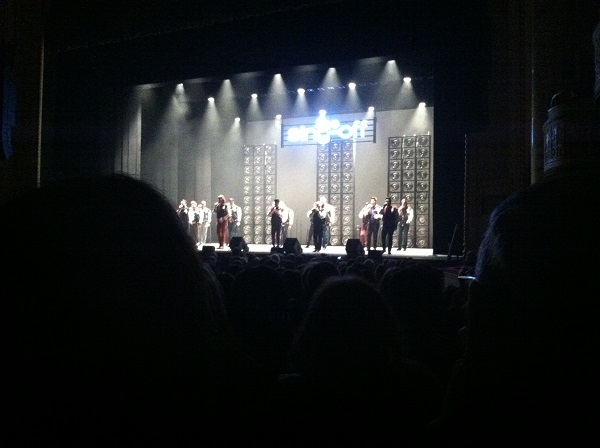 The Sing Off is an a cappella singing competition that has been on NBC for four seasons now. It is GREAT! These groups sing songs and provide all the “music” using their voices. Amazing what they can do. The last season’s winners, Home Free (the ones we wanted to win! ), and the two runners-up are now touring. And we went to see them! It was great. SO. GREAT. We got there early, as per my obsession with not missing anything and making sure I get my last bathroom break in, so we had some people watching time. Observation #1: It amazed me how many people wore tall hair. See the woman in the red shirt? Not only was she tall, but she wore tall hair. I felt bad for the people behind her (and a few rows back for that matter). If you are already tall, don’t wear tall hair! I noticed several other women with this same hair. And it wasn’t even coiffed. It was the throw-your-hair-up-in-a-messy-way-with-a-scrunchy type do. I had been feeling badly about wearing my hair down because I tend to have big, wide hair that some people may not be able to see around (my husband thought I was being ridiculous). But then I realized it wasn’t as bad as that tall-hair woman. Observation #2: It took me a long time to get that tall-hair picture because of the one guy standing up at the end of his isle where he had the isle seat. I assume he was waiting for the isle to fill in so he wouldn’t have to get up a million times. He finally sat down because it was close to the start time, I got this picture, and then a lady came to sit in his isle and he had to get up again! So funny. Observation #4: Speaking of standing up, I’m a fan of standing ovations but only at the end of the show. Not after each act and, sometimes, particular songs. And especially in the winter, when standing up from your seat involves grabbing on to the coat, purse and program in your lap that you’ve already organized just-so to avoid being too hot and to avoid having them fall on the ground. So, I choose to keep sitting and then can’t see because of the people standing in front of me. I wouldn’t have been able to see anyway, if I had decided to stand, because the seats tend to somewhat equalize the varying sizes of people (with the exception of Observation #1 above). I would rather keep sitting and be able to see the group appreciating the enthusiastic applause of people staying seated. 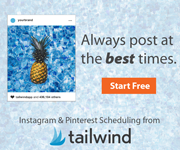 Don’t worry, I already know…. I’m such a weirdo. 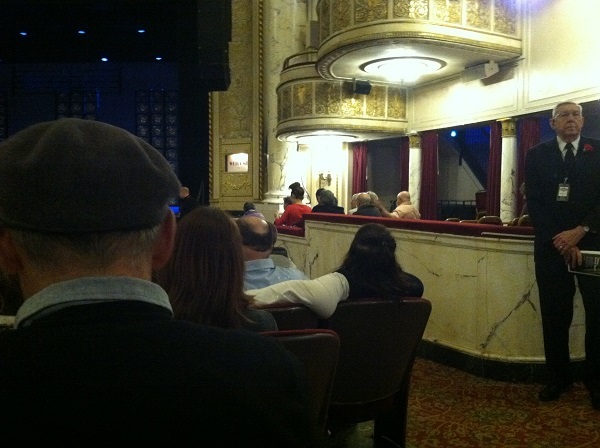 Posted in Uncategorized and tagged sing off tour, theater observations on March 3, 2014 by lizytish.